A nautilus done by Victoria Simpson Collins. There is a common saying about art—we don’t always know how to define it but we know it when we see it. In some ways, that’s true for decorative concrete. Because it can encompass so many different forms, shapes and textures, decorative concrete is not easily explainable. But t’s also not always easily recognizable. What looks like tiles or rocks are neither. Also unlike the art world, the concrete world has typically been reserved for men. That’s changing, as many women stake their claims to the hard work of concrete coatings, poured-in-placed patios and driveways, GFRC outdoor kitchens and highly polished flooring in both homes and commercial buildings. The women we spoke with didn’t set out to be concrete artisans, but they all came to embrace the material’s versatility and creative opportunities. For them, working with concrete is deeply satisfying, and what it can bring to any building is endless. Victoria M. Simpson, owner of Capitol Decorative Concrete in Greenville, South Carolina, was a corporate investment planner for Michelin tire corporation for 12 years. At the time, her brother-in-law owned a decorative concrete distributorship for Increte and she joined as a bookkeeper almost 28 years ago. She also has paralegal and piano performance degrees, and worked as a freelance bookkeeper. When her children were young, Simpson, now 59, intended to refocus on part-time bookkeeping. “While I was managing my brother-in-law’s company, it seemed like everyone kept quitting!” she says, with a strong Southern accent and a quick laugh. “It’s really dirty, it’s really hot and it’s really hard work. As each one left I would take on a little more of the business and was able to gain experience in every area.” Before long she had her own pair of concrete boots and was out with the crew every day. After about seven years of running their business, she opened her own installation company. Capitol Decorative Concrete was established in 1998, and has been going strong ever since. Her work has won several decorative concrete awards from L. M. Scofield Co., including the grand prize for an acid stained residential pool patio in 2013. 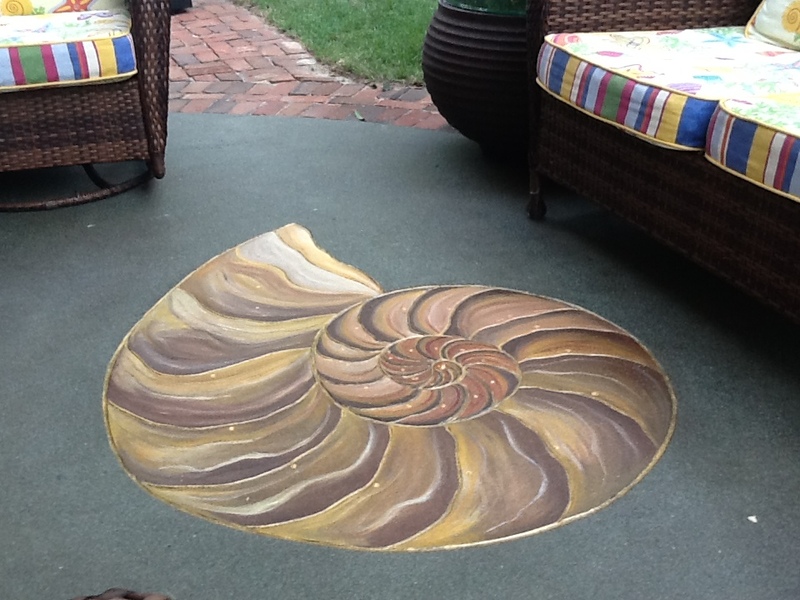 That patio featured dark walnut acid stain and blue and white flourishes hand-painted with acrylic paints. One of her recent jobs was to create a railroad track scene going from the outside walkway through the front door leading to the dining room for a restaurant called The Railhouse, located near railroad tracks in Fountain Inn, South Carolina. In 2016, she took the grand prize in the Scofield award’s Artistic Division for the retail floor of The Charleston Marina Resort in Charleston, South Carolina. Located on a historic harbor, Simpson recreated a map of the harbor on the floor. She divided an 8 1/2-by-11-inch navigational map into sections, enlarging each square to 3-by-3 feet. She penciled in the pattern on the floor, then scored in islands, beaches, marshes, bridges and shipwrecks using a 4-inch diamond blade on a grinder. Numerous acid stain colors were used to create the effects of water and land. Over the years, Simpson has seen more people requesting acid staining, partly because, she thinks, people have more of a re-use mindset. Revitalizing concrete that is already in place makes the decorative side more cost-effective. Capitol Decorative Concrete could charge $14 to $16 per square foot for stamped concrete, while the one-color acid stain, including multiple shades of that one color, is $2.50 per square foot, for example. Multicolor floors and pattern scoring can add $4 to $5 per square foot . . . still a considerable savings over the stamped concrete price. Rachel Knigge (pronounced kuh-NI-gee) has always been a creative soul. Trained as a designer in commercial art and advertising in her home state of Texas, Knigge, 38, moved to Bella Vista, Arkansas, to work as the marketing coordinator for Ameripolish. In addition to various marketing duties, she designed the company’s trade show booths, which initially were simply concrete slabs with solid arcs cut into the surface and each area filled with a different color. Knigge wanted to do more. “I thought it was boring and unimaginative and wanted to add an artistic flair to the surface,” she said, to bring more attention to the slab. She incorporated vinyl stencils that can be applied to concrete, which customers soon began asking for. Step by step, Knigge formulated a system for applying the Ameripolish colors to concrete surfaces. She formed a product line through Ameripolish until 2009, when she created her own business, FLOORmap Stencil Designs, now known as FLOORmaps Inc.
By isolating and exposing different areas of the surface, a variety of mediums such as dyes, cementitious overlays or polyurea can then be applied. She also offers a material that is resistant to sandblasting and a perforated vinyl material that a design can be printed onto and then applied to an epoxy base coat and sandwiched underneath a thick layer of clear epoxy. Knigge continues to search for new ways to apply design and color to concrete surfaces. She is excited about new design possibilities available for precast concrete. Knigge recently discovered a technique called sugar printing, in which an image is printed onto cardboard using a sugar compound, which is set into the precast item. 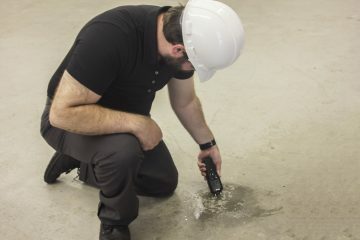 The sugar prevents the concrete from curing properly, so releasing the mold and pressure washing the surface exposes the aggregate only in those areas where the sugar compound touched the concrete. Knigge also helped Carlos and Judy Casanola of California’s Classic Coatings Systems install the gold leaf graphic over black epoxy seen in the episodes of the History show “Pawn Stars.” Recently, Knigge worked with Ed Sabato of New Jersey’s Stonhard to install a 165 foot-wide Porsche logo onto a racetrack near Atlanta’s International Airport that is visible from the air. Knigge is branching out into other areas of decorative concrete artwork such as custom pieces cut using a water jet machine that can be inlaid into flooring. New equipment she’s using allows her to offer other flooring solutions besides stencils, such as custom logos or designs that can be inlaid into precast countertops. Cindee Lundin told her husband, Mark, ‘no thanks’ multiple times after he suggested she consider adding decorative concrete to her repertoire. Now based in Tucson, Arizona, Lundin is originally from Perham, Minnesota, where she and her three siblings were raised on a dairy farm. Lundin began creating faux finishes, plasters, murals, trompe l’ oiel and furniture more than 20 years ago, and now works full time with concrete. Mark insisted. “I told him that if he wanted to do it then go ahead, but I wasn’t interested!” she recalls with a laugh. 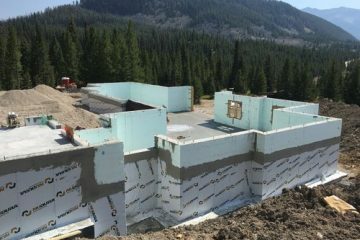 “He went out and learned it and then came back and started sharing what he learned with me.” Now, she’s hooked, and concrete is her sole medium. Before discovering that art was her true passion, Lundin taught at Head Start. She’s an expert in bas relief using concrete and has recently begun creating concrete faux bois furniture with embedded semi-precious stones and other mixed media, a twist on the centuries-old art form. She is also a marketing consultant and trainer for EZ Chem Inc in Atlanta, Georgia, and uses their concrete products in most of her projects. Her business, The Studio by Cindee Lundin, is a 2015 Martha Stewart American Made Awards Furniture & Home Accessories nominee. She is teaching a hands-on workshop creating a bas relief carved concrete mural at the Concrete Decor Show this year, held in San Diego in September. Lundin has created everything from small carved concrete panels to a large 70-foot-long carved concrete mural. That mural, called “Waves of Discovery,” was commissioned by the city of Perham and now greets visitors to the town. Lundin created 18 weatherproof panels, each 4 feet wide and either 7 or 8 feet tall, in her Arizona studio before having them shipped to Perham for installation. Lundin and her sister, Chenoa, a photographer and graphic designer, worked together to project a design of a large loon, trees and vibrant bands of color onto each panel. Lundin carved in numerous details and added objects such as dragonfly wings and turtle shells made of fused-glass. Fifty hidden objects related to the town’s history and natural environment are carved into the concrete for people to seek and find. “The mural was inspired by my and my sister’s love for the Minnesota lakes and the many memories we have of growing up in the heart of it,” she says. At the 2015 Concrete Decor Show in Fort Worth, Texas, Lundin lined a panel with EZ Chem’s Vertical Carving Mix. She used a Dremel tool to carve in a detailed peacock, embedded fused-glass elements for the tail feathers, and colored it in vibrant hues. Her new faux bois furniture creations add a classic yet modern touch to benches and seating for inside the home as well as outside. Three years ago, Smith and her business partner, Ed Begley, had the opportunity to purchase the 20-year-old business Decorative Concrete. The plan was for Begley to run the business while Smith continued her career as an electrical engineer. The business quickly outgrew what Begley was able to manage, however, and Smith stepped in to learn the trade. The company’s business is evenly split between commercial and residential, and offers stamped concrete, overlays, epoxies, vertical carved concrete, hardscaping, Spray Deck (a non-skid decorative overlay system) and polishing. “And plain old brushed concrete too!” Smith says with a laugh. It’s mostly the commercial clients who ask for polishing, although Smith says she sees more homeowners requesting it, or at least wanting to talk about it. The company does a pretty even mix of driveways and patios, but their customers are discovering that there’s more they can do. This originally appeared in our July 2016 issue.